As youthworkers we're not afraid of a challenge - whether its a young person who finds it hard to control their behaviour during a session, a community lead who doesn't understand the value of the work we do, listening to a young person open up about their feelings, or trying to herd a group on a half-term trip - we're always up for giving it a go! Sometimes the challenges seem almost insurmountable. Some lives are so complex and seemingly broken that its hard to see what difference youthwork can make, but our team never say never, and we never consider any situation "impossible" - providing a safe space and a trusted youthworker to just "be there" is often enough to start the process of change in someone's life. Showing that we care, that we're interested, and that we're not going to give up is a powerful message. Sometimes the challenges are deep rooted not just in a life, but in a culture. The Stroud District is an interesting place; there are deep-seated feelings between communities which go back generations. When we first started to engage with the communities in Wotton and Dursley, it was clear that the prospect of bringing together young people from each town was going to be a big challenge; and why would we bother, anyway? Well, one of the key desires of youthwork is to enable young people from different backgrounds to be able to integrate and live together. Its community building, it helps break down fear and conflict, and it makes the world a better place too! Whilst we knew it would be a challenge, we didn't launch madly into a "lets get young people from Wotton and Dursley together" campaign. Instead we built relationships on the ground in both communities, and did 'our thing' locally. 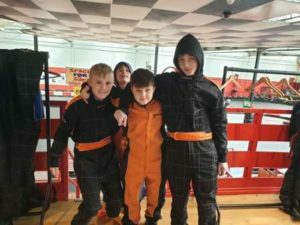 Then during February half-term, we ran trips to Go-Karting in Gloucester from both centres, on the same day, on the same bus. On neutral territory, with lots of fun, and a team of youthworkers trusted by all, we brought together 2 groups of young people, many of whom had never even met before. And the outcome? Everyone had a great time! During the day new friendships were forged and perceived differences were overcome. In the weeks since, we've regularly found young people from one town "turning up" to the youth centre in the other because they want to meet up with their new friends. Barriers are being torn down, historic rivalries are being removed.